Ordered this rug in the apple green color, to go with the house scheme. Works perfectly and brightens up the patio, and has held up great. Only downside is it was on the pricey side as far as patio rugs go. Bring some subtle color into your life with this crisscross rug.Available in multiple color combinations, thishoundstooth-patterned area rug gives your decor a classic look andfeel. This braided rug is latex-free, so you don't have to worryabout guests or children with latex allergies. 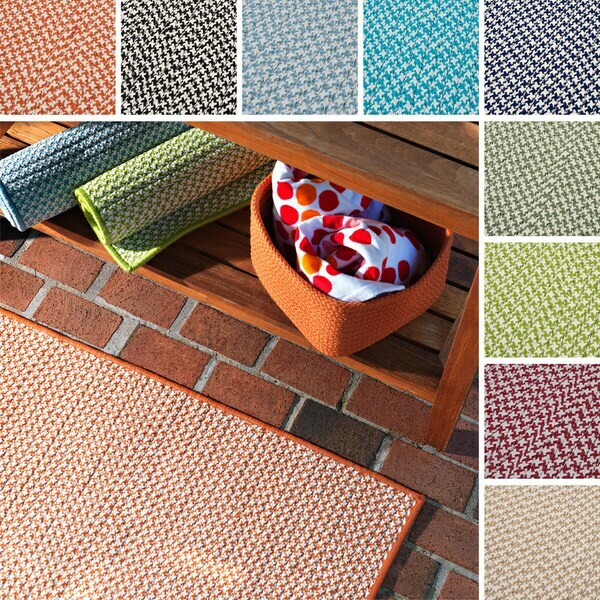 Place this stain- and fade-resistant rug on your patio or inyour living room for a colorful, long-lasting experience. The rug's0.5-inch pile makes it easy to clean, and its polypropyleneconstruction and reversibility make sure you enjoy this rug foryears to come. I purchased this in tan and absolutely love it in our sun room. As an indoor outdoor item, the quality is superb. Our dog had a little problem and I used a damp paper towel and damp white rag to blot it up. One spot came out, the other is subtly present still but not very obvious. I wished that the cleaning instructions would have been on an attached tag. Great quality rug. It is beautiful. It is exceptional value for the price paid. It is a braided rug that will last a very long time. I would highly recommend this rug! "Does the 100% polypropylene fabric have a sheen to it in the sand crisscross indoor/outdoor area rug?" Hello sskipperdoodle, We try to represent the colors of our products accurately, but unfortunately, due to the difference in monitor colors we cannot guarantee that the color will match exactly what you see on your screen. Thanks for shopping with us! Can this rug be used outdoors in direct weather? Does it dry like sunbrella or will it be soaking wet for days? "Can the Lime be ordered in 9 by 12?" Hello ninjasis1, We're sorry, but that size is not available in lime at the moment. New colors/sizes are restocked as they become available, so we would recommend checking back periodically. Thanks for shopping with us!